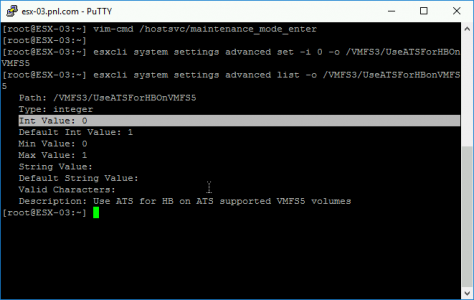 After ESX 5.5 Update 2, VMware added ATS Heartbeat.Some vendors, (like HPE SureStore and VSA) recommend that this is disabled. I can’t find any info about whether it’s safe to do this in production, so to be on the safe side I placed the hosts in maintenance mode first. Confirm that INT Value is set to 0 (zero).